Widespread forest fires across Indonesia have burned tens of thousands of acres over three months, causing high levels of pollution, loss of life, and billions of dollars to the Indonesian government. It is estimated that more than 43 million people have been inhaling toxic fumes, and large parts of Indonesia have been placed in a state of emergency. Most of the fires are believed to have been set to clear farmland during the dry season, but a long term drought enhanced by El Niño conditions have contributed to the fires remaining unchecked due to lack of rain. These images made with data acquired by AIRS, the Atmospheric Infrared Sounder on NASA's Aqua Satellite, show the global concentration of carbon monoxide at the 500hPa pressure level, or approximately 18,000 feet (5,500 meters) altitude. The data are an average of measurements taken over three days, from October 14 through 16, and October 26 through 28, and the high concentration and large extent of the fires over Indonesia are quite apparent. 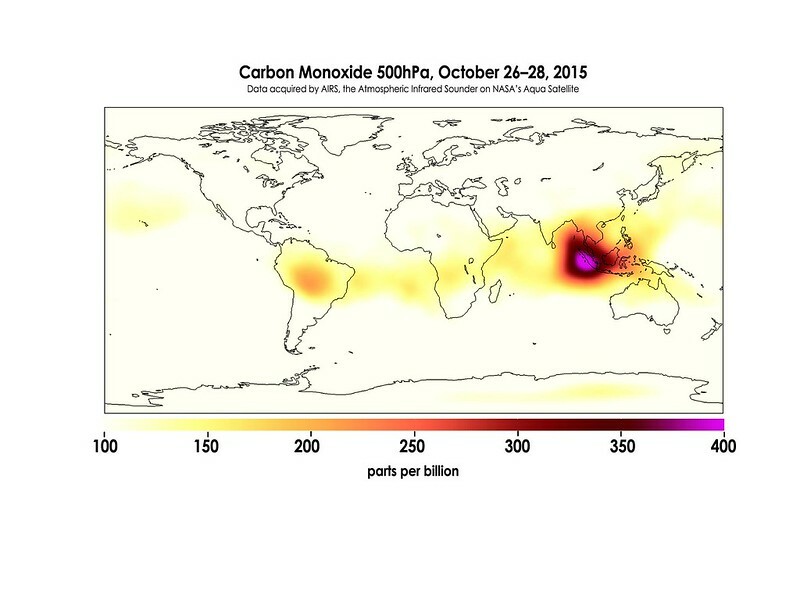 While the scale for this image extends to 400 parts per billion, local values of carbon monoxide can be significantly higher. The Atmospheric Infrared Sounder, AIRS, in conjunction with the Advanced Microwave Sounding Unit, AMSU, senses emitted infrared and microwave radiation from Earth to provide a three-dimensional look at Earth's weather and climate. Working in tandem, the two instruments make simultaneous observations all the way down to Earth's surface, even in the presence of heavy clouds. With more than 2,000 channels sensing different regions of the atmosphere, the system creates a global, three-dimensional map of atmospheric temperature and humidity, cloud amounts and heights, greenhouse gas concentrations, and many other atmospheric phenomena. Launched into Earth orbit in 2002, the AIRS and AMSU instruments fly onboard NASA's Aqua spacecraft and are managed by NASA's Jet Propulsion Laboratory in Pasadena, Calif., under contract to NASA. JPL is a division of the California Institute of Technology in Pasadena. More information about AIRS can be found at airs.jpl.nasa.gov.